For details please click into the map. Take the motorway no. “57” turn off to motorway no. ”46“, follow to the end - direction „HEINSBERG“, at the end of the motorway turn left to road no. “221”- direction „GEILENKIRCHEN“, follow this road no. “221” take exit „GEILENKIRCHEN / ÜBACH-PALENBERG-Frelenberg“, cross the rotary and the following bridge, at the end of the road turn right, follow the road to the next Xing (traffic lights) and turn right, follow now the street „THEODOR-HEUSS-RING“, in 500 meters you will find the City Hotel on the right side of the street. Take the motorway no. “61“ to the Xing „WANLO“, turn to motorway no. “46“ - direction „HEINSBERG“, at the end of the motorway turn left to road no. “221” direction „GEILENKIRCHEN“, follow this road no. “221” take exit „GEILENKIRCHEN / ÜBACH-PALENBERG-Frelenberg“, cross the rotary and the following bridge, at the end of the road turn right, follow the road to the next Xing (traffic lights) and turn right, follow now the street „THEODOR-HEUSS-RING“, in 500 meters you will find the City Hotel on the right side of the street. Take the motorway no. “44“ and turn off exit „ALDENHOVEN / GEILENKIRCHEN“, turn left (rotary!) 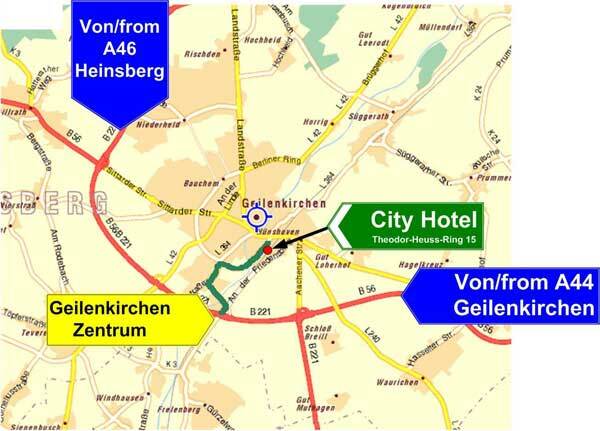 direction „GEILENKIRCHEN”, follow this road no. “56“ direction „GEILENKIRCHEN“, take exit „GEILENKIRCHEN / ÜBACH-PALENBERG-Frelenberg“, cross the rotary and the following bridge, at the end of the road turn right, follow the road to the next Xing (traffic lights) and turn right, follow now the street „THEODOR-HEUSS-RING“, in 500 meters you will find the City Hotel. on the right side of the street. Take the motorway no. “4“ and turn off exit „DÜREN / JÜLICH / GEILENKIRCHEN“, turn right and follow the road no. “56“ direction „JÜLICH / GEILENKIRCHEN“, follow this road no. “56“ direction „GEILENKIRCHEN“, take exit „GEILENKIRCHEN / ÜBACH-PALENBERG-Frelenberg“, cross the rotary and the following bridge, at the end of the road turn right, follow the road to the next Xing (traffic lights) and turn right, follow now the street „THEODOR-HEUSS-RING“, in 500 meters you will find the City Hotel. on the right side of the street.